During the 1948 war, some 600,000 Palestinian Arabs fled their homes to the neighboring Arab states or to parts of mandatory Palestine occupied by Arab states (the West Bank and Gaza). Likewise, within a few years after the establishment of the State of Israel, nearly all of the 850,000-strong Jewish population living in Arab states was either expelled or escaped with just their lives. Most made their way to Israel where they were resettled. While these latter facts may not be that well known, neither are they completely unfamiliar to students of the Middle East. What is less acknowledged, however, is the de facto agreement of Arab states to resettle Palestinian refugees in their respective territories, expressed in closed-door discussions at cease-fire committee meetings and other gatherings with Israeli representatives. Whether the Arab states properly represented the refugees or treated them and their descendants fairly is a matter for the Palestinians and their Arab brothers to adjudicate on their own. The General Assembly. … Resolves that the refugees wishing to return to their homes and live at peace with their neighbors should be permitted to do so at the earliest practical date and that compensation should be paid for the property of those choosing not to return and for loss or damage to property … [and] Instructs the Conciliation Commission to facilitate the repatriation, resettlement, and economic and social rehabilitation of the refugees. As a General Assembly resolution, the U.N. decision was in no way a binding recommendation. Nonetheless, it put forward the notions that Arab (and Jewish) refugees (a) should be allowed to return to their country of origin within the framework of a comprehensive peace if they could be construed as peaceable; (b) or they could receive reparations for damage to or loss of their property if they decided not to return; and (c) resettlement was a no less reasonable option. While the Arab states vehemently opposed resolution 194 and voted unanimously against it (only in the late 1960s did they begin to transform the resolution into the linchpin of their claim to a "right of return"), they did not shirk from quietly entertaining the feasibility of resettling the Palestinian refugees in their territories. Iraq, Syria, Jordan, and Egypt all recommended the resettling of the Palestinian refugees within their borders. Most of these states also demanded economic aid from Western powers as payback for agreeing to the option. But their agreement was kept quiet since they did not see eye-to-eye on this matter with both the Palestinians and their own populations. At the 1949 Lausanne Conference convened by the U.N. Conciliation Commission, Jordan, Syria, Egypt, and Lebanon appeared as one bloc to discuss an agreement that also included a solution to the refugee problem. While they had previously rejected resolution 194, they now demanded that any deal had to be resolved on that basis. They also told the U.N. Conciliation Commission that they, the Arab states, represented the Palestinian refugees. Three delegations of refugees that tried to reach the conference were treated with contempt by their Arab brethren and denied access to the discussions. When they asked for an interview with the Egyptian delegation, they were unceremoniously removed by force. At a later September 1951 Conciliation Commission conference in Paris, only delegations from the Arab states were asked to represent the refugees. A critical aspect of these discussions and one that has been largely forgotten since that time was that recommendations and attempts at resettling the Palestinian Arabs also focused on issues of compensation to the Arab states for the expenses incurred in the absorption of their brethren. Alongside infusions of cash from Western sources, Arab governments viewed with equanimity the confiscation of Jewish property to help offset costs, property that was coming into their hands as a result of a massive population transfer out of their borders occurring at the same time. Many Jewish communities in the Arab states predated the Muslim conquest of the Middle East by hundreds of years. Many of their members had grown prosperous, served in their host nations' law courts, military, and where such existed, parliaments and considered themselves full-fledged citizens. Many more eked out a livelihood as best they could, aware of a precarious situation in which today's good Muslim neighbor might turn out to be tomorrow's oppressor. Whatever their material circumstances, within a few years of the establishment of the State of Israel, the bulk of this population was forced out of their homes, leaving behind the vast majority of their possessions. Contemporary Palestinian spokesmen and advocates are largely silent about the effective population exchange carried out at that time. While they may argue that the Arab states were not empowered to represent them or claim (falsely) that Jews who emigrated did so because of Zionist manipulation rather than persecution and harassment, the fact is that part of the stipulations of U.N. resolution 194 were actualized in that compensation for relocation was obtained—albeit through the forcible divestment of Jewish citizenry—and resettlement occurred. Whether that compensation went to the proper recipients or whether resettlement was done in a half-hearted fashion, the international community, alongside the Arab governments, put in place practicable, if not perfect, solutions. A closer look at that population exchange and the accompanying transfer of billions of dollars' worth of Jewish property and holdings to the Palestinian refugees is in order. At the time, both Jordan and Iraq were constitutional monarchies ruled by members of the Hashemite family. Their approaches to the refugee and resettlement problem differed markedly, largely due to geographical and ethnic factors as well as the absence of a Jewish community in Jordan versus the well-established one of Iraq. It must be remembered that up to 1974, Jordan considered itself the representative of Palestinian rights since most of its citizens (approximately 60-70 percent) were of Palestinian origin. This perception was formalized in a 1962 Jordanian white paper by Prime Minister Wasfi al-Tal that explicitly designated Jordan as Palestine and as the representative of the Palestinians in its territory. Amman maintained this position even after the creation of the Palestine Liberation Organization (PLO) in 1964 and the 1967 Six-Day War. It was only in 1974, after the Arab League recognized the PLO as the "sole representative of the Palestinian people," that Jordan grudgingly changed its position for the first time due to the political pressures. Jordan's founder, emir-turned-king Abdullah (r.1921-51) was the architect of the policy to assimilate Palestinian refugees into his kingdom. In June 1950, there were 506,200 Palestinian refugees listed by the United Nations Relief and Works Agency for Palestine Refugees in the Near East (UNRWA) in the Hashemite Kingdom of Jordan, 55 percent of the total of registered UNRWA refugees. Refugees were settled on both banks of the Jordan River. Abdullah's policy included the granting of full citizenship to the refugees in order to absorb them into his kingdom. The warm welcome they received there impelled additional refugees from Gaza and other Arab countries to come to Jordan and receive suitable living quarters and citizenship. The majority of refugees and their descendants listed with UNRWA currently live in Jordan. According to the agency, only 350,899 Palestinian refugees live in ten official camps out of the 2,034,061 registered refugees, including the 140,000 registered refugees arriving in Jordan from the West Bank and the Gaza Strip after 1967. This is in addition to the million-and-a-half Palestinians not listed as refugees who are full-fledged Jordanian citizens (out of a total population of 6,508,271 million people). In fact, about 95 percent of all Palestinians residing in Jordan hold Jordanian citizenship and enjoy its benefits. The exception is the approximately 100,000 refugees from the Gaza Strip who settled in Jordan over the years. The members of this small group hold temporary Jordanian passports but do not qualify for full rights like the others, notably the right to hold a government job. Since 1948, quite a few politicians of Palestinian origin such as Tawfik Abul Huda, Anwar Nusseibeh, Hussein Fakhri Khalidi, Ahmad Tuqan, Kassim Rimawi, among others, have risen to high office in the Hashemite Kingdom of Jordan, including cabinet posts and even the premiership. The situation in neighboring Iraq was quite different. Though nominally ruled by the Hashemite king, Faisal III, real power was held by Western interests and off-and-on during the 1940s and 1950s by Prime Minister Nuri Said. Iraq also had a large and flourishing Jewish population reaching back to biblical times, which had long been active in Iraqi affairs, including commerce, culture, and in the modern period, the Iraqi parliament. Despite this, a pogrom in June 1941—the farhud—took place, which changed the entire trajectory of Jewish life in Mesopotamia and which laid the groundwork for the population and wealth transfer plans of the 1950s. Led by a pro-Nazi Iraqi prime minister, Rashid Ali Kaylani, and the exiled Jerusalem mufti Hajj Amin Husseini, the pogrom lasted for three days. Some 190 Jews were murdered, hundreds of Jewish women were raped, and at least 2,000 people were wounded. Jewish homes and Jewish-owned stores were ransacked and destroyed. The farhud was a marker that foretold the end of the ancient Jewish community in Iraq. While some Iraqi Jews cautiously tried to rebuild their lives, evidence began to mount that they were no longer welcome in their millennial home. During the 1948 war, Iraqis began to take measures against "the enemy within." In the first days of the war, more than 300 Jews were arrested for having "given support to Israel." Shafiq Ades, one of the richest members of the Jewish Baghdad community, who had sat with government ministers, represented the Jewish community at court, and who had contributed greatly to Iraq's economy was accused of Zionism and communism and publicly hanged. All of his assets, estimated at many millions, were confiscated for the benefit of the Defense Ministry. Nor was this an isolated incident: The Jews of Iraq understood clearly that they would be forced to abandon their property if they wished to escape with their lives. Although he opposed the pro-Nazi leaders who had come to power in Iraq during World War II, Nuri Said was chiefly responsible for the final expulsion of Iraqi Jews and for the confiscation of their property. During the months of May-July 1949, he turned to the U.S. and British representatives in Baghdad with the recommendation that there be a population exchange between the Jewish citizens of his country and the Palestinian refugees. Though the idea was raised, in part, following a British recommendation to resettle the refugees in the fertile river valleys of Iraq, London strenuously objected to Said's plan arguing that this type of agreement would be an inequitable exchange of educated and often prosperous Jews for a population of uneducated refugees with no professional skills. On October 14, 1949, Said continued with his attempts to convince the Conciliation Commission that only states that had Jews to expel should resettle the Palestinian refugees. At the same time, an opinion survey was carried out in Iraq regarding a population exchange between Palestinian refugees and Iraqi Jews. This proposal was rejected by Israel's foreign minister, Moshe Sharett, who declared that Israel could not agree to the confiscation of the vast properties of the Iraqi Jews. In March 1950, as masses of Iraqi Jews desperately tried to leave the country, Baghdad passed the "Revocation of Citizenship Bill" allowing Jews to leave if they surrendered their citizenship. Tens of thousands departed as soon as they could despite the Israeli government's difficulty in absorbing them. A year later, the Iraqi parliament passed a law confiscating all properties belonging to Jews who moved, or wished to move, to Israel and who had thus relinquished their Iraqi citizenship, placing the assets under a governmental guardianship department. The seized amount has been estimated at around $243 million (about $6 billion in today's terms) at the very minimum. Said claimed this was retribution for the confiscation of Palestinian assets by the Zionists. After the law's ratification, the British asked Said to absorb at least some Palestinian refugees; the prime minister replied that he was ready to absorb a limited number of refugees but not hundreds of thousands. In the end, Iraq took in only 4,000 Palestinian refugees convoyed in trucks by the Iraqi army, a number "balanced" at that time by the departure of over 130,000 legal (and clandestine) Jewish refugees. UNRWA was not allowed to operate in Iraq; instead, Baghdad established its own refugee division to care for the Palestinians' needs. Whether any of the confiscated Jewish assets made their way into the hands of the resettled Palestinian refugees remains to be answered. Neighboring and sparsely populated Syria was an ideal country for the mass resettlement of Palestinian refugees. In fact, before 1920, many Syrians and Palestinians considered themselves to be part of one nation—Greater Syria—while what became the British Mandate of Palestine was termed Southern Syria. In April 1949, Prime Minister Husni Za'im signaled his readiness to sign a peace agreement with Israel in exchange for specific conditions including substantial geographic concessions. He explicitly informed U.S. representatives of Damascus's willingness to absorb and resettle over a quarter of a million refugees in its territory—at least three times more refugees than Syria actually absorbed in 1948. At the Lausanne Conference, Za'im's emissaries let Israel know that Syria would absorb 300,000 refugees in exchange for economic aid. In the end, these negotiations went nowhere as Za'im was overthrown in a military coup and executed a mere four and a half months after coming to power. Even so, Palestinians were resettled in Syria, the majority coming from the 82,194 refugees registered with UNRWA in June 1950. There are ten official refugee camps in Syria today and three more unofficial ones, including the Yarmouk camp, a district of Damascus that became a desired living area. Up until the recent civil war, the Assad regime treated its Palestinians relatively fairly and allowed them to integrate into local and national politics. Since 1956, according to Syrian law 260, the 1948 Palestinian refugees are equal to Syrian citizens in the following areas: employment (including governmental jobs), vocations, and education, but are excluded from being elected and becoming members of parliament. They are allowed to participate in municipal elections like everyone else. Although they retain their Palestinian nationality, according to Palestinian sources, "These are always referred to as those who are in effect Syrians." The Palestinians even have official status in the Syrian Baath Party and participate in its leadership. In fact, during the Lebanese civil war, many Palestinians escaped to Syria and rebuilt their homes there. Part of the reason why Syria became an attractive destination for Palestinians is that as in Iraq, the cost of resettling refugees was offset in part by the confiscation of Jewish assets. As did Iraq, Syria had a sizeable and prosperous Jewish community; in 1943, there were at least 30,000 Jews living there. But in 1949, in the wake of Israel's independence, the Syrian government passed a law freezing all Jewish bank accounts. The main motive behind this action, as declared by the Syrian rulers, was to provide a solution to the problem of the Palestinian refugees inside its borders. The regime took the most convenient path, which was to confiscate the Jewish assets in its country, mostly houses, and pass them to Palestinian hands. This practice was institutionalized in a 1967 law stating that the "property and possessions of deceased Jews are confiscated by the government; the heirs must pay for its use. If they cannot, it will be handed over to the Palestinian Arabs." There are no details regarding the exact number of Jewish properties received by Palestinian Arabs in Syria. Damascus's implacable hostility to Israel resulted in worsening conditions for its Jewish community, and thus most sought to leave. The government periodically permitted Jewish emigration but only if the Jews were prepared to abandon their assets without selling them. In 1967, after a decisive Syrian defeat in the Six-Day War, new laws were passed that increased the restrictions on the rights of Syrian Jews. All Jewish assets were confiscated. Governmental proclamations explicitly stated that Palestinian refugees were to enjoy the Jews' property and were the actual owners of Jewish assets. Those Jews who remained in Syria were forced to pay rent on their own property; if they were unable to keep up the scheduled payments, their property was awarded to Palestinians. Finally, as the result of discussions at the 1991 Madrid Peace Conference, the last remnants of the mostly destitute Jewish community in Syria were allowed to leave, most eventually making their way to Israel. To the south lay Egypt, which had taken a decisive role in invading Israel in 1948 and thus bore its fair share of responsibility towards the resulting flood of Arab refugees. Unlike Syria, Egypt was not interested in absorbing refugees in its interior. Of the approximately 600,000 Palestinian refugees who fled during the war, approximately 82,000 went to Egyptian-held Gaza. A small portion of the refugees, mainly those who had family ties in Egypt or who offered the appropriate bribe, made it to Egypt proper; according to Palestinian figures, in the year 2008, there were 64,728 Palestinians outside of Gaza living in Egypt. Many of the refugees who reached Egypt were forced to leave in the end and were deported back to the Gaza Strip. After the war broke out [in 1948], my mother, who was in the ninth month of her pregnancy, was arrested. They wanted to butcher her. They had bayonets. They abused her and afterwards they left her. On one of the evenings, a crowd came with sticks and anything else that they could find in order to kill the family because they heard that they were Jews. The gatekeeper swore to them that we were Italians and that is why they only cursed, surrounded my parents, my brothers, and myself, who was only a tiny baby. The next day my parents fled. They left everything, a pension, work, and a home, and they left Egypt. More than 25,000 Jews left Egypt without their assets following the 1948 war, after being attacked by Arabs mobs. But with the Free Officers Movement's coup of July 1952, more dramatic changes were soon to follow. Nationalist sentiment against Westerners had already resulted in rioting against the "foreign" Jews, and in the same week that the Egyptian revolution broke out, further attacks took place. Jewish stores were robbed, and Jewish property looted and burned. In the immediate aftermath of the officers' coup, there was an attempt by the Egyptian government to allay the Jewish community's fears, including the return of property seized after the 1948 war. At the same time, under the framework of the 1954 "Alpha Plan," Washington and London attempted a Palestinian refugee resettlement program in the Sinai Peninsula, but this process was scuttled due to an escalation in Egyptian-Israeli tensions. In 1954, the exposure of an Israeli spy ring in Egypt that had recruited Egyptian Jews (the so-called Lavon affair) exacerbated ill-feelings. The escalation of the conflict with Israel led Egyptian president Gamal Abdel Nasser to take a number of steps against the Jews in his country, including another roundup of suspected "Zionists." The nationalization of the Suez Canal, which in turn resulted in the Sinai campaign of October 1956, marked the beginning of the end of the ancient Jewish community in Egypt. On November 22, 1956, all Egyptian Jews were defined as Zionists and labeled enemy citizens. The massive expulsion of Egyptian Jewry began with the total confiscation of Jewish wealth. Some of these assets were given to the Palestinian refugees who were living in Cairo, and the rest went into the Egyptian state treasury. For example, the house of Charles Victor Castro, an exclusive home in an expensive Cairo suburb, became the official residence of Egyptian president Anwar Sadat. None apparently went to the Palestinians housed by Egypt in the Gaza Strip; instead Cairo chose to rely on aid from UNRWA. Conditions worsened for the remnants of Egypt's Jewish community before and after the Six-Day War, and today, there is no longer any active Jewish community in Egypt. Only a few solitary Jews, most of them women, and a few deserted synagogues remain from the magnificent communities of Cairo and Alexandria. While the majority of Palestinian refugees did not, for the most part, migrate to the North African countries, these states used the fate of the refugees and the 1948 war to make the lives of their Jewish populations—some of which dated to biblical times—unbearable until they were expelled from their countries or felt compelled to leave. Having endured a horrible pogrom in the Libyan capital of Tripoli in June 1948, most of the 38,000-strong Jewish community fled the country with 90 percent of them settling in Israel. In 2004, Mu'ammar Qaddafi's son, Saif al-Islam, declared that all the exiled Jews could return to Libya and receive reparations based on their former assets though their homes would remain in the hands of Palestinian refugees residing in the country. Likewise, Tunisian Jewry dwindled from some 105,000 people in 1948 to a mere 1,500 by 2010 with 15,000 escaping to Israel during the 1948 war and in its immediate wake, and the rest following suit after Tunisian independence in 1956. A similar pattern occurred in Algeria, whose 117,000-strong Jewish community fled in 1962 while in Morocco—where some 270,000 people lived in the largest Jewish community in the Muslim world—secret negotiations between Israel and the royal court, and a $10 million "gift" to the king, produced a royal permit for the Jews to leave—albeit without taking their belongings or selling their properties and businesses. By 1976, only 17,000 Jews remained in the country. Little notice has been paid to the fate of the 850,000 Jewish refugees from the Arab states, about 550,000 of whom were resettled in Israel. Similarly, the resettlement of most of the Palestinian refugees in the host Arab countries, creating a de facto population exchange, has been overlooked. 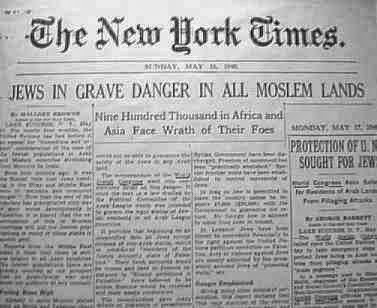 New York Times Headline, May 16, 1948: "Jews in Grave Danger in All Moslem Lands". To be sure, unlike the international community, the Arab states were quite aware of this reality, as was the PLO leadership. On November 9, 1973, the Voice of Palestine broadcast the PLO's "Plan for Peace." According to this arrangement, all of the countries of the world including the Arab states should immediately and publicly allow the "Zionist immigrants" to Israel to return to their countries of origin where they would enjoy the same rights and responsibilities that were theirs previously before they were coerced into emigrating due to Zionist propaganda. After all of the Jews who immigrated to Palestine since 1917 had returned to their countries of origin, the Palestinians would be able to return to their homeland. Nor was the reality of the de facto population exchange lost on many Israeli Arabs. This was especially true for activists in the various Israeli communist parties of the 1950s and 1960s who acknowledged such an exchange but viewed it as a conspiracy between Western imperialist interests and reactionary Arab collaborators. The Israeli Arab author Emil Habibi, for example, argued that backward-looking Arabs—those who supported the Hajj Amin Husseini or Abdullah—were actually working hand-in-hand with the Zionist leadership to steal freedom from the Palestinian nation, throw the best of its sons into jail, and disinherit the workers and the peasants—an absurd proposition given Hajj Amin's burning hatred of Jews and Zionism and his relentless fight against them. Similar assessments were voiced by Tawfiq Toubi, Fuad Nassar, Suleiman Najab, and many others from the communist parties in Israel, Jordan, and the Gaza Strip. At the same time, the newly established State of Israel, having just absorbed hundreds of thousands of Holocaust survivors was shortly thereafter confronted with the momentous task of integrating another 550,000 refugees from the Arab countries. Jewish refugees from the Arab states to Israel were settled during the 1950s in transit camps similar in quality to the refugee camps established in Arab countries for the Palestinians. Over time these transit camps were transformed into development towns or neighborhoods in larger cities to which they were adjacent. The last of the camps closed around 1963. The U.N. did not establish any special agency like UNRWA to help the Jewish refugees (or for that matter, any other refugee community in the world). At the Paris conference of 1951, the topic of the "Arab" Jewish refugees was raised, in particular, the dispossession of Jewish assets left in Iraq. Israel demanded that a link be created between the Jewish exodus and the Jewish assets left behind in the Arab states and that of the Palestinian refugees, but nothing came of the discussion. As a result, the State of Israel saw no alternative but to pass its own law regarding the use of absentee assets. This enabled the government to use the assets of the Palestinian refugees to help resettle and support its own Arab Jewish refugees. These refugees from the Arab states did not have the right to reparations from Germany or to additional pensions, and most did not have family members that could aid them in their absorption into Israel. The issue of confiscated and reappropriated assets is habitually brought up by Palestinian advocates, albeit in a one-sided way. In a detailed 1957 report, the Arab states demanded at least $3.5 billion for lost Palestinian assets, a figure that even U.N. officials considered inflated. Arab sources usually refrain from referring to the problem of Jewish property. In her 2009 article "From Plundering to Plundering: Israel and the Assets of the Palestinian Refugees," for example, Palestinian advocate and Israeli citizen Suhad Bishara demanded the full return of all Palestinian property to its owners in accordance with the current value but studiously avoided any attempt to deal with the more substantial expropriated Jewish property. The Israeli-Palestinian privately negotiated Geneva accord also addressed reparations for Palestinian refugees and their descendants (requiring no evidence of property ownership) but totally ignored Jewish property appropriated by the Arab states ostensibly on behalf of the Palestinian refugees. Finally, a comparison of lost Palestinian assets and those of the dispossessed Jews bears review. According to 1950 U.N. estimates, Palestinian assets amounted to approximately £120 million, which, in today's terms, would be the equivalent of $3.4 billion. Meanwhile, the worth of Jewish assets left behind was estimated in 2003 at over $100 billion. Put differently, according to U.N. data, the total value of Palestinian assets is lower than just the minimum estimate of the confiscated assets of Iraq's Jews (approximately £156 million). In other words, any Palestinian demand for reparations has been paid many times over although the funds went to their host Arab countries. There was an effective population exchange between the Arab states and Israel, one that was tacitly recognized by leaders of the Arab states at the time. There is also a demonstrated and direct link between the de facto resettlement of the Palestinian refugees and the confiscation of their property by Israel and the expulsion of the Jews from the Arab states and the confiscation of their assets by the various Arab governments. Yet, while the displaced Jews were fully integrated into Israeli society, Arabs of Palestinian origin, including grandchildren of the actual refugees, living in relative comfort in the host countries (e.g., the 550,000 Palestinians in Saudi Arabia and the Gulf States), continue for the most part to list themselves as refugees and to enjoy the monetary and other benefits granted them by UNRWA. When UNRWA was established in 1949 to ease the plight of Palestinian refugees and facilitate their reintegration into the region's economic life, all Arab states as well as Israel supported it. The contributing nations, led by the United States, donated $200 million to develop projects in the Arab states, and it was up to UNRWA to undertake this mission and manage the money. As explained by Lex Takkenberg, the agency's senior ethics officer, UNRWA's mission during the 1950s was to invest money in the host countries according to the number of refugees living in their respective territories in order to facilitate resettlement. Up to the 1960s, UNRWA's policy was one of rehabilitation for the refugees and improvement of their living conditions through investments in education and health thereby enabling them to integrate into their host countries, but from the 1960s on, the agency strayed from its policy of refugee rehabilitation and resettlement. This transformation was due to many factors including regime change in many of the Arab states, the rise of the PLO, and organizational changes inside UNRWA. Ultimately, how the U.N. and UNRWA choose to privilege the descendants of Palestinian refugees while discriminating against refugees in other parts of the world is their right and the right of the donating nations to the world body. From the point of view of the Israeli government, however, during the 1950s and 1960s, the Palestinians, as part of the "Arab nation," were represented on the world stage and in international forums by the Arab states, which quietly but deliberately solved the Palestinian refugee issue in a de facto manner through a mutual population and asset exchange. According to UNRWA data, only a quarter of the descendants of the Palestinian refugees still live in camps, the majority of these in Lebanon. The descendants of the refugees who arrived in Gaza have been resettled in the quasi-independent area governed by Hamas while the descendants of the refugees in the West Bank are settled, for the most part, in the area of the autonomous Palestinian Authority. The bulk of the Jewish refugees of Iraq, Egypt, and Syria—as well as the Maghreb and Yemen, which took in no significant number of Palestinians—were settled in the Jewish state. This in turn means that Israel has no responsibility whatsoever toward the descendants of the 1948 Palestinian refugees and no obligation to aid them other than out of purely humanitarian concerns, together with the rest of the enlightened world. Any attempt to argue otherwise stems from misplaced political considerations and the rewriting of history. Shaul Bartal is a lecturer in the Department of Middle Eastern Studies at Bar Ilan University. His most recent book is The Fedayeen Emerge: The Palestine–Israel Conflict, 1949-1956 (Bloomington, 2011). Efraim Karsh, "How Many Palestinian Arab Refugees Were There?" Israel Affairs, Apr. 2011, pp. 224-46. For a different estimate see the PLO's official report submitted to the U.N.: Munazzamat at-Tahrir al-Filastiniya, Dawrat Shu'un al-Mufawadat, "Nazara ala al-Mufawadat," Ramallah, 2009, p. 17. See, for example, the Lebanese Minister to the Secretary of State, Oct. 1, 1949, Foreign Relations of the United States (FRUS), vol. VI; "Economic Development in the Middle East. British Plans for Social and Economic Development," British Foreign Office, FO 371/75092, FO Minutes, Events, Dec. 21, 1949, British National Archives (Kew), p. 1416. "Palestine—Progress Report of the United Nations Mediator," U.N. General Assembly (UNGA) res. 194 (III), New York, Dec. 11, 1948. Yafa Zilbershatz and Nimra Goren-Amitai, The Return of the Palestinian Refugees to the Territory of the State of Israel, Ruth Gavison, series ed. (Jerusalem: The Metzilah Center for Zionist, Jewish, Liberal and Humanist Thought, 2010), pp. 38-42. Efraim Karsh, "The Palestinians and the 'Right of Return,'" Commentary, May 2001, pp. 25-31. Report of the director, UNRWA, Sept. 28, 1951, UNGA A/1905, para. 79; Nitza Nachmias, "UNRWA Betrays Its Mission," Middle East Quarterly, Fall 2012, pp. 27-35. "Summary Record, a Meeting between the Conciliation Commission and the Relief and Works Agency," U.N. Conciliation Commission for Palestine, Feb. 6, 1951, A/AC.25/SR.204. Ibid. ; Nachmias, "UNRWA Betrays Its Mission." Lex Takkenberg, "UNRWA and the Palestinian Refugees after Sixty Years: Some Reflections," Refugee Survey Quarterly, no. 2-3 (2009), pp. 254-5; Jacob Tovy, Al Miftan Beita, Hitgabshut Mediniyuta shel Israel Be-Sugiyat Ha-Plitim Ha-Palestinim1948-1956 (Jerusalem: Herzl Institute for the Study of Zionism and History and Ben Gurion Research Institute, 2008), pp. 90-4, 159-71. Nachmias, "UNRWA Betrays Its Mission." Walter Eitan, Bein Israel La-Amim (Tel-Aviv: Massada, 1958), pp. 50-1, 61; Mordechai Lahav, Hamishim Shnot Ha-Plitim Ha-Palestinim 1948-1999 (Tel Aviv: Rosh Tov, 2000), pp. 432-3; Benny Morris, Ledata shel Ba'ayyat Haplitim Haplestinim 1948-1949 (Tel Aviv: Am Oved, 1991), p. 352. Lahav, Hamishim Shnot, pp. 431-42. Yaakov Meron, "Why Jews Fled the Arab Countries," Middle East Quarterly, Sept. 1995, pp. 47-55. Moshe Shemesh, MehaNakba LaNaksa: Hasikhsukh Ha-Israeli-Arvi ve-Habeaya Ha-Le'umit Ha-Falestinit, Darko shel Nasser Le-Milhemet Sheshet Ha-Yamim,1957-1967 (Jerusalem: Ben Gurion Research Institute, 2004), pp. 329-67. Report of the director, UNRWA, July 1, 1956-June 30, 1957, UNGA A/3686, p. 12. "Where UNRWA Works: Jordan," U.N. Relief and Works Agency for Palestine Refugees in the Near East, New York, accessed Apr. 17, 2013. Mariam Itani and Mo'in Manna, The Suffering of the Palestinian Refugee (Beirut: Al-Zaytouna Centre, 2010), pp. 43-4, 52-3. Martin Gilbert, In Ishmael's House, A History of Jews in Muslim Lands (Cornwall: Yale University Press, 2010), pp. 150-4, 166-9; Dafna Zimhoni, "Memshelet Iraq ve-Haaliya Hagdola Shel Hayehudim Le-Israel," Pe'amim, 39 (1989), pp. 66-8. Gilbert, In Ishmael's House, pp. 190-3. Zimhoni, "Memshelet Iraq," pp. 68-9, 70-3; Tovy, Al Miftan, pp. 207-11. From Jerusalem to Foreign Office, Feb. 14, 17, 18, 1949, British Foreign Office, PRO, FO 371/75182, E1571/93; Yaakov Meron, "The Expulsion of the Jews from the Arab States and the Palestinian Stand vis-à-vis the Jews," State Government and International Relations, Summer 1995, p. 32; Meron, "Why Jews Fled the Arab Countries"; Tovy, Al Miftan, pp. 208-10. Tovy, Al Miftan, pp. 210-2. Ibid. ; Foreign Minister Moshe Sharett from the Knesset podium, sess. 239, Mar. 19, 1951, Knesset Minutes, vol. 8, p. 1539. Gilbert, In Ishmael's House, pp. 242-5. Tovy, Al Miftan, p. 210. S. Bendor: Report on the Visit of J. McCage to Israel, Apr. 1, 1951, Documents of Israeli Foreign Policy, Israel State Archive, Jerusalem, vol. vi (1951), doc. 99; Zimhoni, "Memshelet Iraq," pp. 97-8. British Embassy in Baghdad to Foreign Office, PRO, FO 371/82239, E1823/22, June 5, 1950. James H. Keeley, U.S. Ambassador to Syria, to the State Department, May 1, 1949, FRUS, vol. IV, pp. 965-6; Itamar Rabinovich, The Road Not Taken, Early Arab-Israel Negotiations (New York: Oxford University Press, 1991), pp. 62-3. Keeley to the State Department, May 1, 1949, pp. 965-6; Rabinovich, The Road Not Taken, pp. 62-72. "Annual Report of the Director," A/3686, UNRWA, New York, June 30, 1957, p. 12. Itani and Manna, The Suffering of the Palestinian Refugee, pp. 53-4. Lahav, Hamishim Shnot, p. 479. Mohsen Mohammad Saleh, History of Palestine: A Methodical Study of the Palestinian Struggle (Cairo: Al-Falah Foundation, 2003), p. 99; Itani and Manna, The Suffering of the Palestinian Refugee, pp. 44-5. Joan Peters, From Time Immemorial, The Origins of the Arab-Jewish Conflict over Palestine (Tel Aviv: Hakibutz Hamuahad, 2003), p. 75; Adi Schwartz, "Hurban Kehilot Artsot Arav: Hahazon Shenignaz," Tchelet, May 11, 2011, pp. 34-5. Gilbert, In Ishmael's House, pp. 265-6; Ada Aharoni, "Ha-Hagira Ha-Kfuya shel Ha-Yehudim ve-Hashalom," International Forum for the Literature and Culture of Peace, accessed Nov. 24, 2011. Gilbert, In Ishmael's House, pp. 303-9. Samih K. Farsoun with Christina E. Zacharia, Palestine and the Palestinians (Boulder: Westview Press, 1997), p. 137. Itani and Manna, The Suffering of the Palestinian Refugee, pp. 36, 47-8. Gilbert, In Ishmael's House, pp. 219-21; Schwartz, "Hurban," p. 29. Gilbert, In Ishmael's House, pp. 252-4; Schwartz, "Hurban," p. 36. Shaul Bartal, The Fedayeen Emerge: The Palestine–Israel Conflict, 1949-1956 (Bloomington: Author House, 2011) pp. 135-8; H. Byroade, the American Ambassador in Cairo to the State Department, Mar. 4, 1955. U.S. National Archive, RG 884.86/3-455. Gilbert, In Ishmael's House, pp. 251-64. Elihu Birnbaum, Yehudi Olami (Jerusalem: Makor Reshon, 2010), pp. 268-79. Alex Sholem, "Come Home: Gaddafi's Son Invites Libyan Jews to Return," The Jewish News, Apr. 16, 2004. Natan A. Shuraki, Korot Ha-Yehudim Betsfon Africa (Tel Aviv: Am Oved, 1975), pp. 246-7; Gilbert, In Ishmael's House, pp. 178-97, 271-4, 283-5. Aharoni, "Ha-Hagira Ha-Kfuya"; Gilbert, In Ishmael's House, pp. 278-80. Yocheved Weintraub, ed., Irgunei Ha-Mehablim (Tel Aviv: Ministry of Defense, Feb. 1974), pp. 58-9. Hans Lebrecht, Ha-Palestinaim - Avar Ve-Hoveh (Tel-Aviv: University Publishers, 1987), pp. 188-9. "The Unification Conference," The Active Committee of the Israeli Communist Party (MAK'I), Haifa, Oct. 22-23, 1948, pp. 24, 36-7; Lebrecht, Ha-Palestinim, p. 189. Tovy, Al Miftan, pp. 211-6; Lahav, Hamishim Shnot, pp. 441-2. Tovy, Al Miftan, p. 79; Don Peretz, Israel and the Palestine Arabs (Washington, D.C.: The Middle East Institute, 1958), p. 143. Suhad Bishara, "Mi-Biza Le-Biza: Israel ve-Rekush Ha-Plitim Ha-Palestinim," Adalah's Electronic Monthly, Sept. 2009. "Geneva Accord: A Model Israeli-Palestinian Peace Agreement," para. 73, accessed Apr. 19, 2013. Gilbert, In Ishmael's House, p. 329. Itani and Manna, The Suffering of the Palestinian Refugee, pp. 36-7. U.N. General Assembly (UNGA) res. 513, Jan. 26, 1952; UNGA res. 614, Nov. 6, 1952; report of the director, UNRWA, UNGA res. 720, Nov. 27, 1953; Lahav, Hamishim Shnot, pp. 464-9; Zilbershatz and Goren-Amitai, The Return of the Palestinian Refugees, pp. 27-31; Takkenberg, "UNRWA and the Palestinian Refugees," pp. 253-9. "Statistics," UNRWA, New York, accessed Apr. 19, 2013. See, for example, Yehuda Shinhav, "Was There a Transfer of Arabian Jews? The Iraqi Jew and National Accounting," Ha'aretz (Tel Aviv), Apr. 10, 1998. Technorati Tag: Jewish Refugees and Palestinian Refugees and Arab Refugees.